Do you follow Nigel’s blog, Engineered to Slide? Well you should, he’s the crazy DIY fabricator behind two awesome S13 Nissan builds, one of which was part of the starting line-up of posts I made when this blog debuted. 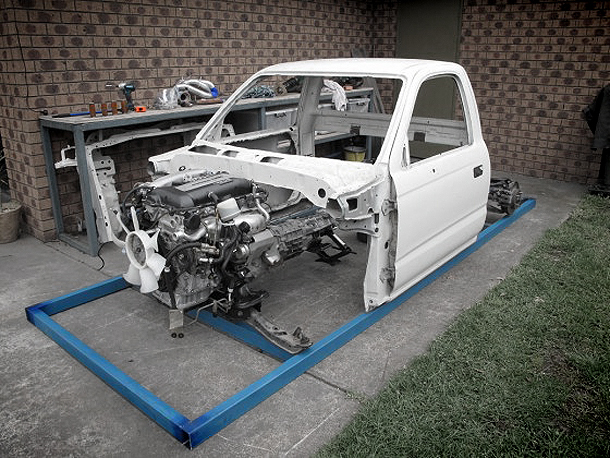 He’s just started a new project which I think you’ll be interested in, a hollowed-out Toyota Hilux ute/pickup being built around a custom chassis with a drive-line and suspension setup donated from an S15 Nissan Silvia. I’m very excited about this build because I know from Nigel’s previous work that it’s going to be finished, and finished to a high standard, this guy doesn’t muck around! Make sure you keep up with the progress by following the updates on his blog, I’ll be sure to post another update here as the build progresses further.